Using LibAnswers Query Spy.... To Your Advantage! 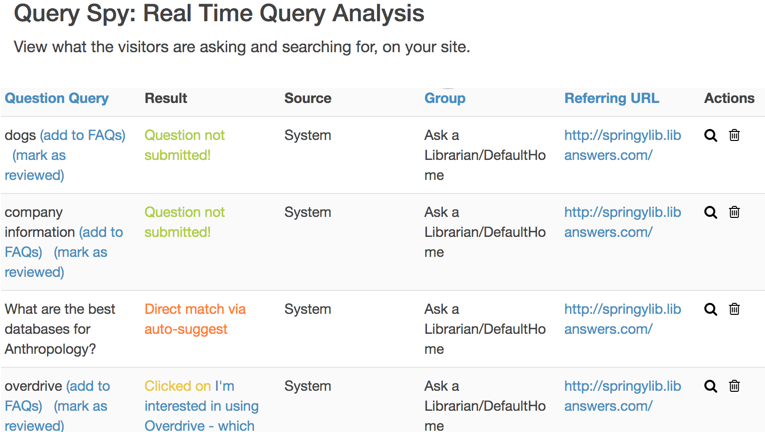 Query Spy can be a helpful insight into your patrons' questions and searching habits. I will demonstrate how I review Query Spy for search terms and question phrases that patrons use. I then will integrate the terms as Tags into existing FAQs to increase the chance that they will be discovered in new searches or create new FAQs if not in our system. I will demonstrate the different features in Query Spy to sort/view queries by submitted, matched, clicked on, and not submitted, as well as the option to mark as reviewed and/or add to FAQs.